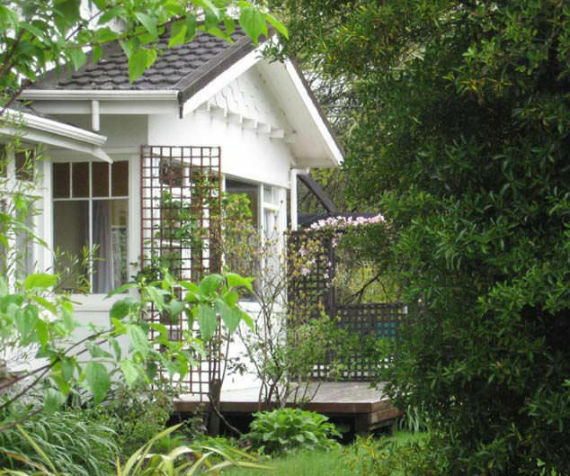 Set on an acre of land that is both maintained garden, rural and natural. A stream defines one side of the boundary and there is a large fenced area that is toddler safe for their youngest son. The house is circa 1930's that has been carefully restored. It has 3 bedrooms with a sun-room that is easily used as a bedroom if they want. There are french doors all around the house leading onto various decks and out into the yard. On the property is an old 'bulking shed' where they used to hold large bundles of tobacco when the property was used by tobacco farmers. This shed is huge, almost like a small hanger. The 'blokes area' is a small, well built unit off the shed and also has a wood fireplace in it. There is another shed as well (which was originally used to dry hopps, and is called a hop kiln.) There are about 30 fruit trees, and the gardens are simple but lovely. How dreamy is this?